The first one-part, high-gloss marine spar varnish that can be rapidly recoated without sanding between coats. Apply up to 5 coats in 1 day. Cures to a rich, warm amber. Great UV protection and gloss retention. Also available in matte. NEW! For a matte finish with greater clarity and depth, Lust is also available in a High Gloss & Matte 2-Quart Combo Kit that includes 1 quart of Lust High Gloss Varnish and 1 quart of Lust Matte Varnish. Apply the high gloss first to create build coats that showcase the beauty of the wood grain, then overcoat with a couple of coats of matte to remove the gloss and achieve a gorgeous matte finish. In addition, Lust High Gloss and Lust Matte are now available in 2-Quart kits—buy 2 and save! We named this product Lust because we had a rabid desire to create a one-part, high-gloss spar varnish that was super glossy, flowed well, could be hot-coated, and didn’t need sanding between coats. Until now, only synthetic finishes mimicking the appearance of varnish allowed multiple coats without sanding. They are popular not for their finish quality, but for their ease of application and time savings. There’s nothing wrong with that, but there’s no substitute for the timeless beauty of real varnish. Until now, achieving such a finish meant lots of time and energy spent applying multiple coats and sanding between each. We concocted, we tested and retested, and Lust was born. We were driven by our lust for Lust, you might say. 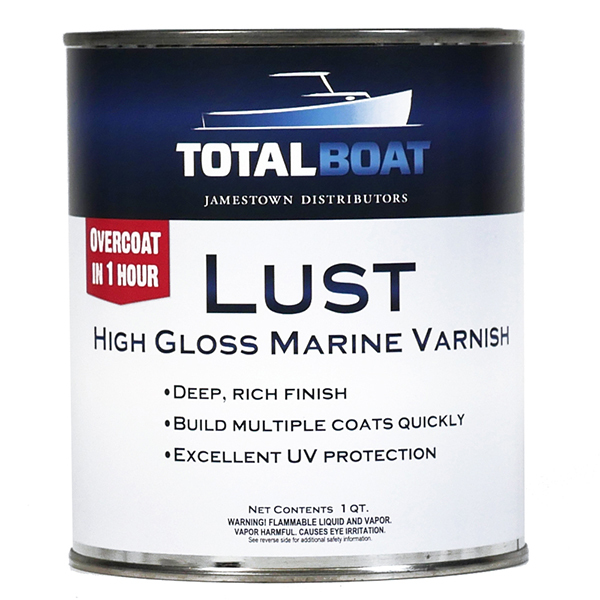 Its unique linseed oil modified polyurethane formula and its rapid recoating capability can’t be found in any other marine varnish. Lust has a viscosity similar to traditional European varnishes. But unlike traditional European varnishes, it can be recoated in as little as one hour at 72°F. And again, without requiring sanding between coats. The gloss improves, layer by layer. A total of 6-8 coats provide the best UV protection and the highest gloss. If you prefer a matte finish, Lust Matte provides a smooth-as-satin finish that downplays the shine and lets the natural beauty of the wood speak for itself. Lust High Gloss dries fast, hard, and wet-looking. The finish is smooth and durable, with a gloss level so shiny it looks wet, even when it’s dry—making it ideal for brightwork. To protect that glossy amber sheen, Lust is heavily fortified with UV stabilizers. Just as the gloss becomes glossier layer by layer, the UV protection becomes stronger as more coats are applied. Recommended number of coats per day: 2-3 light, smooth, even coats per day for two to three days. Up to five coats can be applied in one day under optimal conditions. See Technical Data for application details. 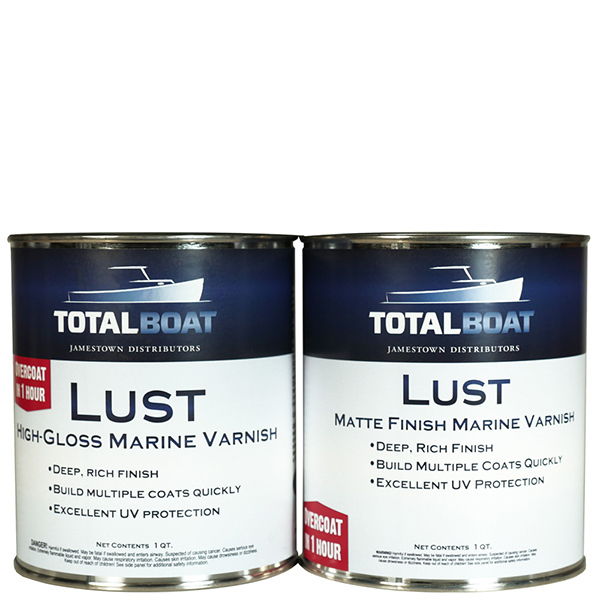 Hint: TotalBoat Wood Sealer can also be used on new wood before applying Lust to avoid any reducing and mixing on the first coat. 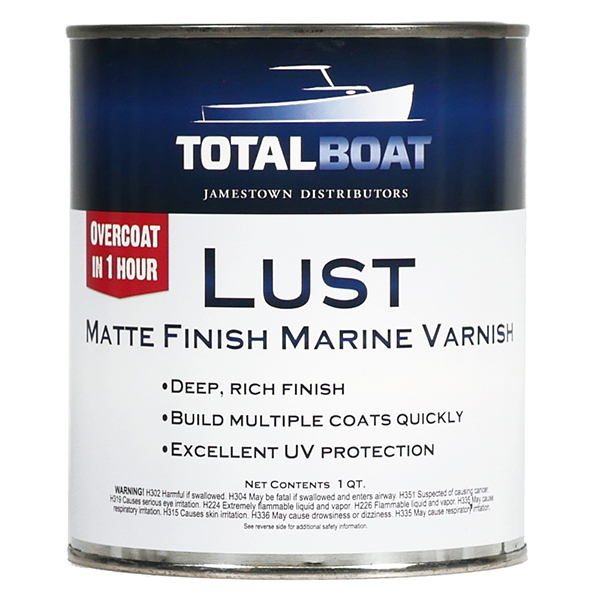 Simply add 2-3 coats of TotalBoat Wood Sealer on sanded and cleaned bare wood, allow to dry for 24 hours, then apply Lust as directed in the Technical Data sheet.